A corpse way or corpse road is an historical track across country from a settlement that did not have a graveyard to one that did. These mark the route taken from outlying places to the nearest place of internment. A few of the roads are marked on maps and even signposted but most are only known from antiquarian references, or local reputation. For centuries the right of sepulture, that is the church’s permission to have a consecrated graveyard, was jealously guarded. There are examples of remote villages petitioning the authorities, even up to the Pontiff, to be granted the right for a more local resting place, often citing the difficulties of the journey to the nearest one over mountain, moor or marsh and in severe weather. 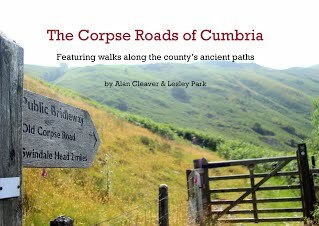 The Corpse Roads of Cumbria by Alan Cleaver and Lesley Park (Chitty Mouse Press, 2018) is the first full survey of these cortege ways in a county known for its remoteness and bleakness. The authors describe the routes, with directions enabling walkers to follow them, and note interesting features on the way such as reputed coffin stones, where the processions are said to have paused and set down their load, holy wells, ancient bridges and lonnings, the local green lanes. They also recount legends associated with the paths, and delve deeply to discover the earliest known references to them, revealing that in some cases all is not quite what it seems. A noted legend tells of a macabre incident which was the inspiration for The Shadow of a Crime (1885), the first novel by Hall Caine, the highly popular Victorian novelist. As this new study relates, Caine explained, in My First Book (1892), that he had heard it from his grandfather. “My mother’s father,” he noted, “was a Cumberland man, and he was full of the lore of the hills and dales.” The story told how not once but twice horses carrying a coffin over the mountains were startled, bolted and disappeared, but were sometimes still be heard or glimpsed still carrying their burden over the lonely country (there is an extra twist or two to the yarn in Caine’s telling too). This thoroughly researched and fascinating study also offers vignettes about local funeral customs and folk tales, and is a richly sombre compendium full of unusual and often previously unrecorded details. This definitely sounds like something I want to have a look at. Right up my alley.